Look, mom, I have one hundred thousand dollars! "Look, mummy, I have one hundred thousand dollars!" my daughter yelled from her room as I walked up the stairs with her baby sister. One hundred thousand dollars I thought, where did she get that? Certainly not from her lemonade stand last week. As I entered her room, she greeted me with her favorite pink calculator--the number 10,000,000 typed on it. "See, mummy, see?" she exclaimed. Clearly, we need to work on the fact that typing a number into your calculator doesn't exactly make money appear, but, you know, we'll get there. "Ohhh," I responded. "I like how you are talking about big numbers, but that number is actually ten million." "Ohhhhhh. Ten million," she repeated as she looked at the number and began to count the zeros. "Mummy, it has a one and seven zeros!" "That's right," I responded. "It has one one and seven zeros." Before I had even completed my sentence, Isabella was already typing a new number into the calculator. "What's this number, mummy?" she asked. "And this?" she asked after typing in another zero. She continued to add zeros until she reached the calculator's eight-digit limit--ten million. "Look, mama, it's ten million!" she shouted proudly. "That's right. I'm so proud you remembered your new number," I responded. fifty-four thousand four hundred ninety-three. I know what you're thinking: my preschooler is too young to be talking about such large numbers! Yes, she is not necessarily capable of understanding the concept of ten million and how it relates to say, the number ten (and the ten crayons she has on the table) but she is capable of seeing it written out and noticing the pattern as she counts the multiples of ten with you: ten, one hundred, one thousand, ten thousand, one hundred thousand, one million, ten million. She's also not too young to hear adults use large numbers in everyday conversation. If we speak about fifty-four thousand four hundred ninety-three the same way we speak about eight, we are teaching our preschoolers that "large" numbers aren't scary, they are a part of everyday life, just like "small" numbers. Exposing your preschooler to "large" and "complicated" numbers at an early age will help her build confidence with numbers and, later, build confidence in her abilities in the subject of mathematics in general. If you're from Massachusetts, chances are you've heard of Polar Seltzer. What!? You haven't?! Ok, read this article before continuing. The summer of 2017 brought us four limited edition flavors of bubbly bliss: Unicorn Kisses, Mermaid Songs, Yeti Mischief, and Dragon Whispers. Isabella, who loves anything related to unicorns (and who can blame her) wanted to pick up a 6-pack of Unicorn Kisses so we could all give it a try. Because we have been working on sharing in the Milkosky household, almost any time we purchase anything at the store, Isabella always wants to make sure we have enough to share with everyone. "Mommy, do we have enough for everyone?" she asked. "If there are four people in our family and six cans of Unicorn Kisses, do you think we have enough?" "Hmm," she pondered. "Mommy, Daddy, Jacqueline, and me!" she squealed as she tapped a different can while announcing each name. "And we can give this one to Emma and this one to Jackson," she said as she pointed to the remaining two cans. "Great idea," I said. "We have six cans of Unicorn Kisses. We have four people in our family. That means we can each have one can and there will be two cans left over." I demonstrated by grouping four cans together and removing them from the group of six. "And we can give those cans to Emma and Jackson!" "Do you want to play a game about sharing seltzers?" I asked. We headed to the toy area and sat down. "What if there were only three of us? You, me, and Jacqueline. Would we have enough for everyone?" I asked. "Yes," Isabella responded as she tapped each seltzer and said our names. "Could each one of us have more than one?" I asked. "Hmmmm," she paused. "I don't know." I took three cans from the six that we had and placed one in front of Isabella, one in front of Jacqueline, and one in front of myself. "We each have one can, but we still have some cans left." Before I could finish my thought, Isabella began placing the remaining cans in front of all of us. "Mummy, look, we can each have two!" "Very good!" I responded. "Now, what if it were just you and Jacqueline. How many could you each have?" Isabella placed a can in front of herself and then in front of her sister. Then, she placed another in front of herself and another in front of her sister. She continued this until she exhausted the pile of six cans. "We can each have three!" she announced. We continued the "sharing seltzer" game for the next half hour--modifying the number of people with whom to share as well as the number of original cans (I broke out another 6-pack). To my daughter, it was all a game, but to me, it was a nice introduction to division and remainders. What happens when you have to share with more people? With fewer people? What happens when you have more cans to share? Fewer cans to share? Are there any cans left over when you share? Why or why not? These are all great questions you can ask your preschooler when you play the "sharing seltzer" game. These questions help to lay a great foundation for the concepts of division and remainders. The use of manipulatives, in this case, the seltzers, will help your preschooler have a more concrete understanding of division by allowing her to physically see how division and remainders work. Her teachers in middle school and high school will also use manipulatives to discuss division and remainders, especially when it comes to more complex topics such as imaginary numbers. 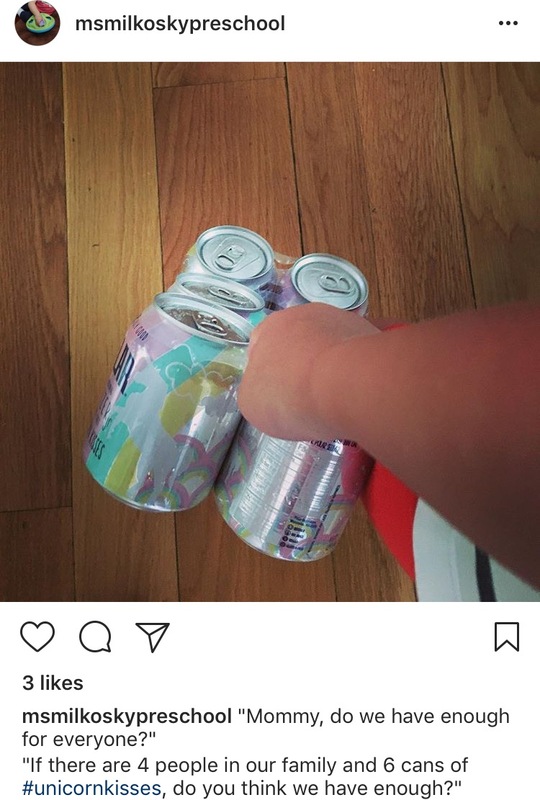 Don't worry, for now, you and you and your preschooler can just stick to imaginary friends...and sharing seltzer with them. "Look, mummy, I made you a picture," my preschooler shouted as she ran from the kitchen, a piece of white scribbled paper flapping in her hand. "'X' ten equals one!" She placed the paper down in front of me as I stared in disbelief. My daughter had just written her first equation. How could this be? We had never spent any time discussing equations. We do frequently write down numbers, like when Isa realized forty-four "matched" and wanted me to write it down so she could practice writing it. Then, I remembered. I moonlight as a mathematics tutor for middle and high school students and last week was my "busy season". In preparation for the tens of students who would descend on my house for help studying for their midyear math exam, I did over 1,000 math problems--and many involved equations. Isabella loves to "do what mummy is doing" and I recalled she frequently sat next to me while I worked through my students' review packets. Of course she would have asked what I was writing and of course I would have explained it to her. "What are you writing, mummy?" "This is an equation. Five x equals fifteen." "That is an equals sign." "And that's a five and that's a fifteen...and that's an x!" she would have said, pointing at each number and variable. It all made sense. We had talked about equations, in passing, and in her quest to "do what mummy is doing" she had written her first one. My intent with explaining equations to her was not to have her start writing her own, but rather to help her understand what "mummy does for work". I also wanted her to realize math isn't scary, it's something people do every day. The more young children can see math being used in everyday situations, the more comfortable they will become with it and, *theoretically*, the less math anxiety they will have as teenagers. I know what you might be thinking, I'm not a mathematician, so my child won't be exposed to someone writing equations all the time. That's ok. They don't have to be. You probably do plenty of math every day...and you can bring your child in on the fun! If you've ever dined at a restaurant, then you've had to calculate a tip. The next time you do this, say to your preschooler, "now that the meal is done, I'm going to calculate the tip. Would you like to help?" Most likely they will say yes as many preschoolers love to do what adults are doing. You don't have to get them to fully understand what you are doing; simply talking about it (and having them type the numbers into the calculator) is enough to pique their interest. Calculating unit cost of a product at the store is something you are probably already doing. For example, if a 6-pack of paper towels cost $6 and a single roll of the same brand (sold individually) costs $1.50, what should you buy? One 6-pack? Or 6 single rolls? Most likely you calculated the unit cost of the paper towel for the 6-pack and found it was $1 per roll. Since that is less than the $1.50 per roll of the individually priced rolls, you would buy the 6-pack. While the concept of unit cost is definitely too advanced for your preschooler, the idea of talking about numbers and using math to help you decide what to purchase, is not. Talk to your preschooler about why you are choosing to purchase what you are purchasing using comparative language such as "more than" or "less than". If gardening is your thing, there is plenty of math involved, including some that is age-appropriate for preschoolers. Let's say you are planting some plants near your home. Plant A will grow to 4 feet, Plant B will grow to 3 feet, and Plant C will grow to 2 feet. You want to place the tallest plant against the house, the next tallest in front of that, and the shortest furthest from the house. Ask your preschooler if they can help you order the plants from tallest to shortest. Help them use comparative language such as "4 is greater than 3" or "2 is less than 3". Have additional examples of how you use math in your daily life? Comment below! When I originally conceived the idea for Ms. Milkosky Preschool, I intended to focus only on mathematics. What I realized, however, was that I was also teaching my daughter about life and being a good human every day--and these lessons were just as important as the mathematics ones. While Ms. Milkosky Preschool will continue to focus on mathematics, I have decided to also sprinkle in some life lessons. My 8-month-old isn't mobile yet...or so I thought. One day while I was reading to my older daughter, we heard her tea set crash to the floor. It turned out my younger daughter, through a series of rolls and scoots, had moved herself from her play mat to the toy area. While the majority of the toys there would be safe for her to play with, there are a few that are certainly chocking hazards. Several years ago a friend told us about a quick and easy way to determine if a toy is a choking hazard: see if it will fit through a standard paper towel tube or a toilet paper tube. These tubes have interior diameters of approximately 1.7 inches and if a toy passes through them, it's not suitable for young children. A quick google search yielded two YouTube videos from Children's Hospital Los Angeles and Children's Hospital Wisconsin that suggest using these tubes to determine if objects are choking hazards. You can find them here and here. Because my older daughter, Isabella, loves to "help", I knew she would be excited about making the toy area safe for her younger sister, Jacqueline. While playing the does-the-toy-fit-through-the-tube game is a simple math lesson in itself, a few additional questions can help your child improve her ability to critically think. I grabbed a paper towel tube and headed to the toy area. Off to the toy area we go! "Let's make the toy area safe for your baby sister," I said to my older daughter. "Ok!" she gleefully shouted with a huge smile on her face. "We are going to use this paper towel tube to check the toys," I began. "If a toy fits through, it's not safe for your sister and I want you to put it in that bin over there," I explained as I pointed to a big plastic bin labeled "Too Small". Isabella grabbed a plastic coin from a cashier set she has and dropped it into the tube. "It falled through, mummy!" she exclaimed. "It did fall through," I responded. "Why do you think that happened?" "Because," she pondered, "the coin is little and the tube is BIG!" "Exactly," I responded. "Want to learn a new word?" "What new word?" she asked. "Diameter," I responded. "The diameter is the length of the straight line from one side of the circle, through the center, to the other side of the circle." I demonstrated with my fingers on the coin. "So the interior diameter of the tube is greater than the diameter of the coin. That's why the coin fits through." "Ohhhh, diameter, di-ameter," she repeated. As we continued to check the toy area for hazards, I could hear my daughter quietly practicing the newly introduced word. "Diameter, diameter, diameter," she whispered as she scooped up toys and attempted to drop them through the paper towel tube. After a few minutes, she discovered something. "Mommy, mommy, mommy, mommy, look!" she shouted while holding up a wooden disk in one hand and the paper towel roll in the other. "It doesn't fit!" "That's right!" I responded. "Hmmmmm, I wonder why?" "Because, mommy, the diameter of this is bigger than the diameter of this!" she demonstrated as she held up the disk in one hand followed by the paper towel tube in the other. "Very good," I praised. "And I like how you used the new word you learned." For the next 30 minutes or so, she continued to play the does-the-toy-fit-through-the-tube game and happily moved toys to the "Too Small" bin when they failed her test. On the surface this may seem like typical play, and it is, but this play is also steeped in mathematical exploration. Isabella was talking about the measurable characteristics of everyday objects, just like she did the month prior when she learned about getting storrowed. With guidance, she was comparing these measurable characteristics to each other in order to explain why certain events did or did not occur. The coin fit through the tube because its diameter was less than that of the tube. The disk did not fit through the tube because its diameter was greater than that of the tube. As parents and caregivers, we can guide our children on their journey of mathematical exploration by asking them the question that is at the heart of mathematics: "Why?" "Why did the coin fit?" "Why didn't the disk fit?" "What if we turned the coin, would it still fit?" "What if we turned the disk, would it fit?" All of these questions help our preschoolers understand the world--and the mathematics--that surround them every day, laying the foundation for future success. And yes, baby Jacqueline, you can munch on that disk because we know it's safe. Disclaimer: Ms. Milkosky is a mathematician, not a medical professional. Please speak with your child's pediatrician about the best way to make your toy area safe for your infant. "I hope no one gets storrowed this weekend," I said as I scrolled through my facebook newsfeed on the morning of September 1st. "Mommy, mommy, mommy, mommy," my preschooler yelled as she ran across the room to see what I was looking at. "What does storrowed mean?" "This," I responded as I showed her a picture of a truck stuck under a bridge. "Oh, no. The truck didn't fit," she said as she pointed to the screen. "Yes," I replied. "Let's talk about it." If you're from the Boston area, you're most likely familiar with the phrase "getting storrowed". If you're not, I'll explain. There are two roads that run along the banks of the Charles River. Storrow Drive (hence the name) is on the Boston side and Memorial Drive is on the Cambridge side. Both roads have several low-clearance bridges making them unsuitable for trucks. When truck gets stuck under the bridge, it's called "getting storrowed". Though getting storrowed can happen any time of the year, it peaks in September when over 150,000 students descend on Boston's 35 colleges and universities. "Let's make a bridge and a truck," I said to my daughter as I walked to the play area. We picked up some blocks and constructed a simple bridge. Then, I grabbed a train and some blocks to make a makeshift "truck". Will the truck "get storrowed"? "Do you think this truck will fit under the bridge? Or will it get storrowed?" I asked. "Hmmmm," she responded. "It will probably get storrowed," she giggled. "Why did it get storrowed?" I asked. "Because," she reasoned, "the truck is taller than the bridge!" "That's right! How could we prevent the truck from getting storrowed?" "We could make the bridge taller!" she squealed while jumping up and raising her arms above head. "Or, we could make the truck shorter!" she demonstrated as she shrank to the ground. For the next 30 minutes or so we continued to play with the bridge and the truck and tested different heights for each. To some people this may seem like play, and it is, but it's also quite purposeful. My daughter was talking about the measurable characteristics of everyday objects. She was comparing these measurable characteristics to each other and drawing reasonable conclusions about what would or wouldn't happen. We can build on our child's mathematical exploration by asking them questions such as "why did that happen?" or "how can we fix this?" These questions also help preschoolers learn to critically think, a skill that is not only important in school, but also in life. What was so great about this activity was that it happened organically. My daughter simply wanted to understand what a word meant, and we were able to turn that word into a mathematical exploration about measurement. Give it a shot with your preschooler and let me know how it goes! Anyone who has a preschooler knows how challenging it is to keep them focused at mealtime. My spouse and I are always trying to come up with creative ways to keep our daughter at the table and eating instead of creating masterpieces out of marinara sauce on the walls. A magic eraser will get that out, right? While out to dinner with my in-laws last month, my daughter got antsy and wanted to take a walk around the restaurant. "If you eat five more bites of your pasta, then we can take a walk around the restaurant," I said. "Mommy, mommy, mommy, I took two bites!" The mathematician in me just couldn't hold back. It was the perfect set-up. "Wonderful!" I replied. "If I told you to take five bites, and you've already taken two bites, how many more bites do you have to take?" "I told you to take one, two, three, four, five bites," I counted on my fingers. "You took one, two," I continued as I put two fingers down. "How many more bites do you have to take?" She reached her tiny hand across the table and counted, "One. Two. Three. Three more bites, mama!" "Yes!" I responded. "I asked you to take five bites. You took two bites, so now you need to take three more," I continued as I demonstrated on my fingers. And there you have it: subtraction at dinner. What made this so effective was that it happened organically. No flashcards. No drilling. No memorization. Over the last month we have used subtraction at dinner many times and I even created cutouts to help. You can find more detailed instructions on how to do it here. Welcome to Ms. Milkosky Preschool! Hi! I'm Kate Milkosky, a mathematician and former high school math teacher. I founded Ms. Milkosky Preschool to provide parents with resources to help their children explore the beauty of mathematics in everyday life. While the official site won't launch until 2018, you can follow us here for examples of how you can explore mathematics through purposeful play with your preschooler.